Famous quote: "There are no regrets. If one can be proud of one's life, one should not wish for another chance." She is Shirou's Servant, an agile but powerful warrior. 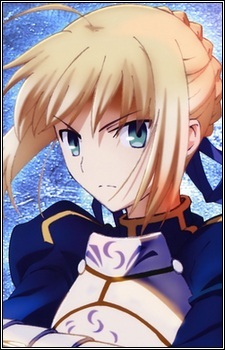 Loyal, independent, and reserved, Saber acts coldly but is actually suppressing her emotions to focus on her goals. Her class is considered the "Most Outstanding," with excellent ratings in all categories. Since her Master cannot effectively provide her with mana, she minimizes her activity to preserve what she has. Saber is frustrated by Shirou's "protective" tendencies, believing his erratic and reckless behavior will jeopardize her chances of winning the Holy Grail War. Saber is a strong-willed young woman who always speaks resolutely. She is courageous, determined, and set on winning the Holy Grail. She constantly insists that she is a knight first and that her gender is of little importance to her. She is resolute in following her own morals regardless of more viable tactics being available should she consider them to be underhanded, leading to conflicts with Kiritsugu over the strategy within the Fourth Holy Grail War. While obtaining the Holy Grail is of the utmost importance, rejecting her chivalry is something that she will not do under normal circumstance even if it should put her at a disadvantage. She doesn't like to be treated as a woman, or even as a human, due to her status as a knight and a Servant. She tries to keep the notion that she is only a Servant, a tool for her Master, first and foremost in her mind, so she initially has no objections about Shirou accidentally seeing her naked body. She slowly becomes more aware of herself after their relationship develops, and eventually even becomes flustered upon the same situation being repeated. She is unwilling to show emotions, as she has suppressed them so strongly and views herself as a knight foremost. Even though she attempts to hide them, her insecurities become more and more apparent, and she later begins to open up more and show her emotions more easily, especially to Shirou. Though she once felt more linked to dragons, she came to enjoy lions after taking care of a lion cub for a month at some point in her life. She claims that it is not that she "likes" them, but rather the happiness she experienced as he became attached to her brought forth a bond with them. He was very energetic, often biting or scratching, but she wished to be able to stay with him until the end. She has had feelings for them since then, and even remembers the fond memories while holding a stuffed lion. Shirou seeing the memory of her rubbing her cheek against the lion comments on it being a time where she looks like a girl her age. She is shown to have a humongous appetite, finishing large servings of rice within one minute. Although she can normally eat anything, Shirou's food education is what awoke her gourmet spirit. She originally did not appreciate modern food as she doesn't actually need to eat as a Servant and because she had believed that all food was like fish and chips. She had very bad experiences with the food in her time, due being limited to meals like large quantities of potatoes, vinegar, bread, and ale or even at times simply eating vegetables alone. She did not concern herself with food much in her life, allowing the cooks to do as they wished. She felt it was unrefined, although she was not displeased by it. She does shudder at the thought of eating it compared to Shirou's cooking. She thought it had been made to suit the tastes of the knights because they acknowledged it as tasting good, but they simply were unable to say it was bad to the King's face. She is very cold and merciless to Illya during most of Fate/stay night despite her being Irisviel's daughter. This is due to the fact that she never asked Irisviel about the name of her daughter, and when Saber sees Illya during the war, she completely disregards the possibility that it could be the same child. She believes that Illya is too young to be the girl she saw getting a piggy-back ride ten years before, and she believes that she would have become more mature like her mother by the time of the Fifth Holy Grail War. She reasons that Illya is a new homunculus completely unrelated to Irisviel with similarities in her appearance due to the Einzbern homunculi looking alike after their creation. Given a chance to casually interact with her, while she doesn't trust Illya at first, she is eventually able to act nicely around her. She is able to freely have fun around her without any worries. Saber is summoned by Kiritsugu Emiya to participate in the Fourth Holy Grail War on behalf of Jubstacheit von Einzbern and the Einzbern family. Kiritsugu partners Saber with Irisviel von Einzbern, to act as Saber's Master in the open while he acts from behind to win with his own methods. On the final day of the Holy Grail war, Saber found the Holy Grail but she also meets Gilgamesh who was waiting for her. He proposes that she becomes his wife while she lays defeated in front of him. Saber refuses as the Holy Grail is just in front of her. Saber destroyed the Holy Grail in the fourth Holy Grail War because Kiritsugu used multiple command seals in order to force her to act against her will. However, she only managed to destroy the Grail's physical form. She was also caught in her own Excalibur blast, sending her back to the battlefield of Camlann. She was the sixth and final servant to perish in the fourth Holy Grail War. Her true identity is that of King Arthur aka. Arthur Pendragon (Uther's daughter who hid her gender to be accepted as King). She has joined the Holy Grail War in order to grant her wish of redoing the selection of King due to her belief that she failed to keep her country from chaos. She wields the legendary holy sword Excalibur (cloaked in a veil of wind to hide its popular identity and thus its owner's) but no longer carries its lost sheath Avalon. The knight is your traditional hero, fighting against monsters and wicked men to save kingdoms from evil. Legends of these heroes have persisted over the centuries and we continue to make new ones today. Top 20 Kuudere Girls in Anime: What is a Kuudere? Kuudere girls are known to be cold and distant. They seem to be without a hint of emotion. Don't let this fool you though, for their true selves are anything but. Come check out this list of popular examples in anime to get a better understanding of what it truly means to be a Kuudere.